Escape the traffic and parking hassles…use transit! PSTA’s Central Ave Trolley line is a quick, easy, and convenient way to get to and from Tropicana Field and downtown St. Pete! Enjoy the longest running college all-star game in the nation with affordable and hassle-free transportation on PSTA to the 90th annual East-West Shrine Game at Tropicana. 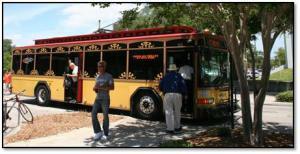 Kickoff is set for 4:00 pm, Saturday, January 17, 2015, which means fans will have plenty of options to get to and from the Trop on PSTA’s popular Central Avenue Trolley. In fact, the trolley runs directly between the stadium and the game’s official host hotel, the world renowned TradeWinds Island Resorts. ← High School Students Can Earn a FREE Trip to Washington, D.C.